Thermal imaging cameras for search & rescue are fast becoming a vital tool for first responders, firefighters, FEMA & military personnel to identify victims in trouble and extract them from harm’s way. We have a variety of small handheld thermal imaging cameras for firefighters who need to be more mobile in the heat of the moment or for rescue operations which require crawling through debris after a disaster or hiking through rough terrain. We also engineer fully vehicle, marine vessel, boom & UAV mountable pan tilt zoom infrared cameras with image stabilization, rugged weatherized housing and integrated CCTV daytime optics for missions that require covering great distances of ground or water in bright, low or no light conditions. Our PTZ infrared cameras come in a variety of configurations to fit any budget and feature long range accurate thermal imaging and video, from anywhere, day or night. Call us today at (702) 369-3966 or toll free (800) 403-2983 to discuss what SPI Corp can do for your fire department, police department or SAR outfit, or email us at sales@x20.org. Don’t let innocent victims get stranded in the dark! The M1D PTZ infrared camera is an extremely versatile thermal imaging system that really CAN do it all. The rugged gimbal design is small and light enough to mount on a UAV/UAS drone, but don’t let the size of this little guy fool you. The M1D performs better than the best of them. Featuring 360° continuous pan tilt zoom thermal imaging, an integrated CCTV daytime camera and a laser pointer, it won’t miss a single detail. The M1D is available in several configurations with up to an 8x thermal zoom capability. It also comes with magnetic and hard mounts, and optional image stabilization module so you’ll always get the best thermal video when mounted to fast moving vehicles or vessels. The M5 family of PTZ Pan Tilt Zoom Short Range SRTI Medium Range MRTI and Long Range thermal imaging cameras for search & rescue provide the ultimate in long range surveillance and can be mounted on vehicles, marine vessels & buildings. Featuring an ultra rugged all weather housing, integrated wiper system, up to 432x zoom (CCTV optical & digital) and 360° full pant tilt zoom color thermal imaging, this is the one you want for serious search & rescue operations. These thermal imaging cameras work in no light conditions, so finding a man overboard or a missing hiker at night is no problem. The M5 is also easily programmable and comes with joystick controls, so you can set it on continuous scan to ensure you always find who you are looking for. The system is so adaptable, you can integrate it into an existing system easily. Secures conveniently with a simple 4 bolt mounting pattern. Take a look at more PTZ options for search & rescue we have available. We can customize your pan tilt zoom thermal imaging systems to optimize them for the best possible performance. The HTMI v2.0 mini FLIR monocular is the smallest, most powerful thermal imager available today. 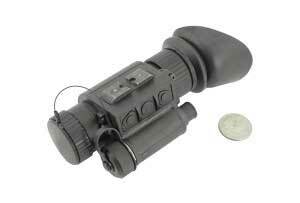 Weighing in at only 8.5 oz, this little FLIR scope has up to an 8x digital zoom and is made to military standards. The unit comes with dual mini rail mounts, so you’ll never have to disengage your mounting system to switch from a helmet to a weapon mount. Small and ergonomic, it fits in your palm for handheld use. Waterproof and Bluetooth capable. The LRTS-15 is one of our newest handheld long range thermal imaging scopes for search & rescue. The unit features a HUGE 75mm lens with a 384 x 288 high sensitivity thermal detector for 60hz real time thermal imaging at a whopping 110,592 pixel density. You won’t find a long range thermal imaging scope with these features anywhere else! Its heavy duty design ensures you can take it on even the roughest search & rescue operations, and comes with 6 hours worth of battery life (rechargeable) and a car power adapter. The automatic and manual gain controls will provide the best possible thermal images & video, in any light or dark condition. 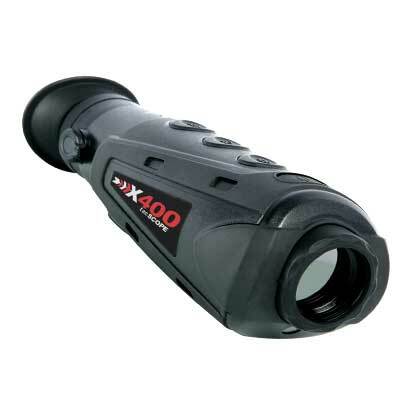 The X400 TacScopes are small yet tough water resistant handheld thermal imaging cameras for search & rescue. They start up in no time (less than 2 seconds) so they are perfect for emergency situations. They are extremely light weight (less than 1lb) and can run up to 15 continuous hours, so they are tailor made to last until targets are safely located. Rain, fog, total darkness of night; these little scopes work through it all. They feature a high sensitivity 384 x 288 thermal sensor that gives you 60hz real time thermal imaging in red hot, white hot or black hot modes. The SPI Spotter is a low cost handheld thermal imaging scope system that is simple to use. The Spotter is able to record 60hz sharp real time long range thermal video and thermal images (color and grey scale) and is SD card compatible for easy storage. Comes with a hand strap for comfort. The Palm IR 250 is one of the most popular thermal imaging cameras for search & rescue of all time, and we have them in limited stock at an incredibly low price. These used thermal imaging systems are in excellent condition and feature BST thermal sensors that still blow away the modern day uncooled microbolomers. These cameras provide ultra-crisp thermal imaging and are perfect for man overboard situations, lost persons in wooded areas and for spotting potential hot spots before they become forest fires. SPI is the only dealer still carrying these fantastic cameras and parts. Call us today to take advantage of an amazing deal on the Palm IR 250 thermal imaging cameras for search & rescue. View our complete catalog of thermal imaging cameras & scopes for search & rescue operations.